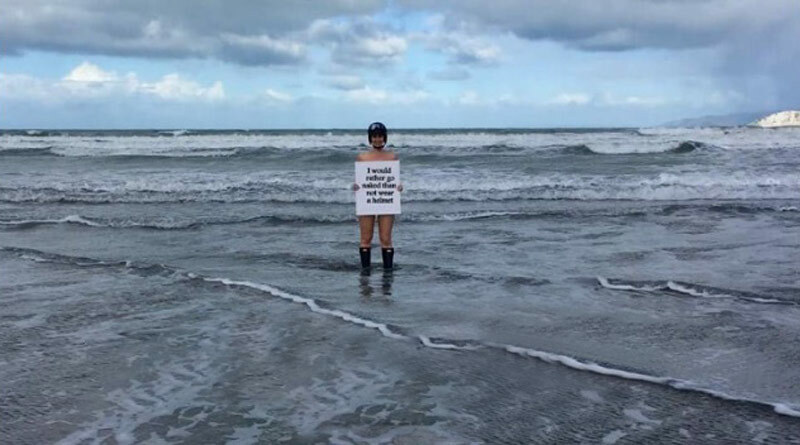 Helmet safety campaigner Elizabeth Charleston bared all for a good cause on a Gisborne Beach this week. Passers-by at a Gisborne beach in New Zealand were forgiven for doing a mid-winter double take this week as a suburban housewife stripped off and marched across the sand wearing only a helmet, gumboots and a smile. But the chilly episode was in aid of a cause very dear to former international model Elizabeth Charleston, also an equestrian and a brain injury awareness campaigner. For the past decade Charleston has been working to educate people from all walks of life on the effects of concussion and Traumatic Brain Injury (TBI), and her buff beach photoshoot was part of that crusade. Like many Kiwi youngsters growing up on a farm and riding horses, Charleston sustained a few concussions over her riding career, but life dramatically changed on Auckland Anniversary Day in 2005. On that fateful day a young horse she was riding flipped over and landed on her, resulting in a life-changing TBI. That severe brain injury affected every single aspect of her life, and in the ensuing years Charleston forged a reputation as a determined campaigner for concussion prevention. Fast forward to July 2015, and realising she needed a slightly different approach to aid her cause, she did something just a bit outrageous. Charleston stripped down and encouraged others to do the same – and thus ‘The Naked Challenge’ was born. Naturally enough, polite society raised an eyebrow but very quickly people from all around the world decided to join in by also getting naked. They posted their photos on social media with the caption “I would rather go naked than not wear a helmet”. Originally The Naked Challenge was rolled out to support International Helmet Awareness Day held by US organisation Riders4Helmets, but very quickly people wanted to know if they could also take part, despite not being involved with equestrian activities. People around the globe involved in work and sporting roles that required the use of a safety helmet jumped on the bandwagon, from snowboarders to supermodels and farmers. Charleston stresses that to take part in The Naked Challenge people are asked to “cover up to maintain their dignity and infer nakedness rather than put everything on display”. “Props and clever photography to capture the occasion are encouraged and the wearing a safety helmet of some description is a must,” Charleston says. Those taking part in The Naked Challenge are being prompted to think outside the box by experimenting with the location of their photos. Earlier this week, Charleston braved a cold winter’s day for her own photoshoot. Despite the poor weather she pressed on, much to the delight of the locals. The only question that remains, Charleston asks, is where will you get naked this August? The Naked Challenge is being held throughout the month of August 2016. It is an R18 event. It is deemed inappropriate for people under the age of 18 years to take part in the challenge. ← Is colostrum the horse world’s latest superfood?